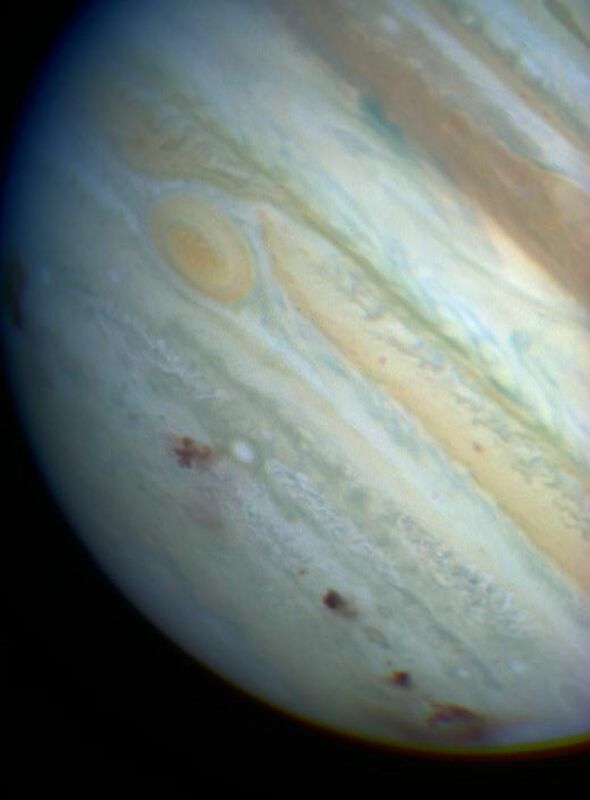 Image of Jupiter with NASA's Hubble Space Telescope's Planetary Camera. Eight impact sights are visible. From left to right are the E/F complex (barley visible on the edge of the planet), the star shaped H site, the impact sites for tiny N, Q1, small Q2, and R, and on the far right limb the D/G complex. The D/G complex also shows extended haze at the edge of the planet. The features are rapidly evolving on timescales of days. The smallest features in the this image are less than 200 kilometers across. This image is a color composite of three filters at 9530, 550, and 4100 Angstroms.